These energy bars are gluten free, dairy free, and packed with nutrient dense ingredients to help sustain you when you are on the go. Superfood flours like protein rich quinoa, magnesium rich millet flour and vitamin E packed almond flour keep you running. To make the bars even more powerful, sunflower seeds that contain a lot of cancer fighting selenium and pumpkin seeds that contain immune boosting zinc are used. 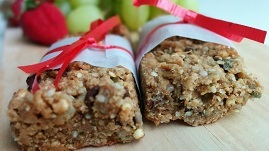 These bars are also filled with protein and healthy fats to help keep you full and sustain you for longer. Try them out to get your energy on the go! Press into an 8-inch pan and put into the freezer for 5-10 min. Remove and cut into bars. Store in the freezer.